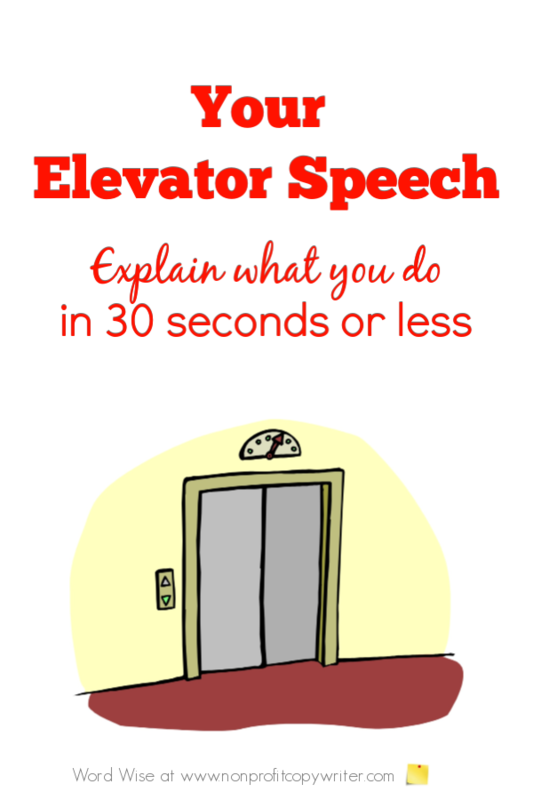 Your Elevator Speech: Can You Explain What You Do in 30 Seconds? Can You Explain What You Do in 30 Seconds? A perfect example of an elevator speech is offered in one of the final scenes of the 1988 Academy Award-winning film, Working Girl. Wall Street secretary Tess McGill (played by Melanie Griffith) has thirty seconds in an elevator to explain to an investment bank CEO how she conceived a lucrative deal for his firm. Tess describes her acquisition idea so clearly and simply that the CEO gives her an executive job on the spot – and fires her boss for stealing the concept from her. In the same way, your “elevator speech” is a brief, concise explanation of what you do, presented in about the time it takes an elevator to go from the bottom floor to the top. Always be on the lookout for opportunities to give your elevator speech to a potential donor, a consultant, your neighbor down the street, a new golfing buddy or even to a stranger next to you on an airplane. If you can’t explain what you do in thirty seconds, or you’ve heard some of your staff make a stab at it and find yourself cringing, chances are others won’t buy into your mission either. Focus on others, not yourself. People don’t care so much about you and your story – they want to know how you help other people. Whose lives do you impact? What kind of burning needs do they have? Use a descriptive hook to explain who. You’re not just a recovery nonprofit, you’re a group of former addicts who walk with current addicts and demonstrate that lives can be transformed through one-on-one relationships. You’re not just a relief organization, you’re a community partner in getting local contributions of food, water and clothing to disaster victims in North America. Explain how you meet those needs. Your listener may think that because you’re an overseas educational nonprofit, you’re raising money to build a school in Ethiopia. In reality, you’ve earned trust with the local Ethiopian people and place teachers in small home school groups, achieving a 95% literacy success rate. Be specific! Show why your work is so essential. You started your organization because there was a special problem. If you didn’t exist, would someone else fix the problem? Demonstrate how you’re addressing needs unmet by anyone else right now. Keep it simple. If you can’t tell your story in straightforward language, rework it. Use your word processor’s readability function. Aim for an eighth grade reading level or lower. Keep it short. Between 90 and 200 words; ten seconds may be too short, sixty is too long. Practice. At any time, one of your staff could be in the same situation as Tess McGill and face the opportunity to cultivate a new partner. Make sure each one can deliver her own answer to the question, “What do you do?” Justify it to your team like this: the elevator door opens. Bill Gates gets on with his checkbook in hand. You have less than half a minute to describe what you do to make a difference in the world. Make sure you – and everyone on your staff – can tell him.